This last week, I was fortunate enough to attend a Tech Field Day event, in Boston, Massachusetts. 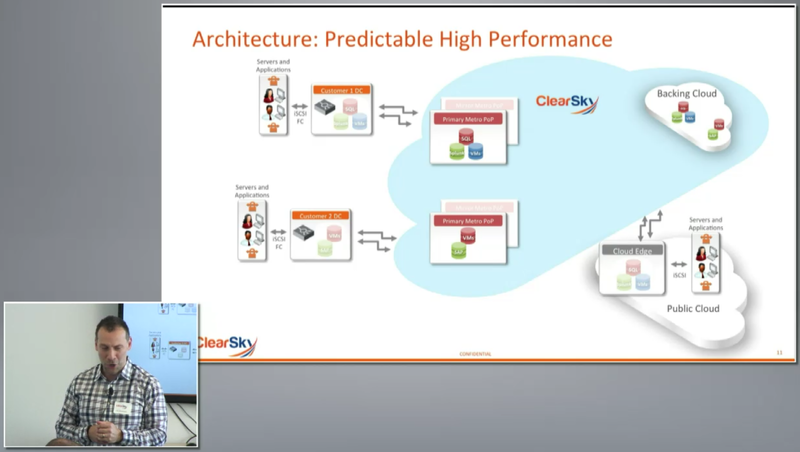 During the event, ClearSky invited us to their headquarters and took the time to present their vision and solution. I must admit, I had not heard of ClearSky prior to the event, but doing some quick reading, my appetite was whet to learn more. 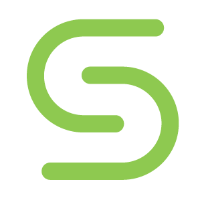 Founded in 2014, ClearSky aims to provide storage in a way that is a little outside the box. Most storage admins are aware that the majority of data on their storage arrays is cold data – blocks that aren’t accessed frequently. Hot data, blocks that change very rapidly, is where performance metrics truly matter. Rather than supply boxes of drives to hold all your data, ClearSky instead will provide a box that acts as a storage gateway. With options like Fibre Channel and iSCSI, this box is full of SSD, sized to cache all your hot data. Then, it’s connected to ClearSky metropolitan data centers, via redundant, low latency, dedicated 1gb/s lines to the arrays that hold all the data. The initial buy-in starts at 20TB, and after that is a pay as you go model for additional storage. By hosting the data at ClearSky’s metropolitan data centers, businesses no longer need to worry about the availability of their storage and can focus on just the consumption of that storage. As an added benefit, if a business has multiple offices in the metropolitan area, they can both be connected back to the same storage, each with their own caching storage gateway, allowing for a metro cluster without the need for synchronously replicated storage between 2 nodes. ClearSky also has a cloud edge appliance, that will allow you to consume the same storage via iSCSI in AWS, making your workloads very mobile between private and public cloud. All management is done via a plugin to the vSphere Web Client. 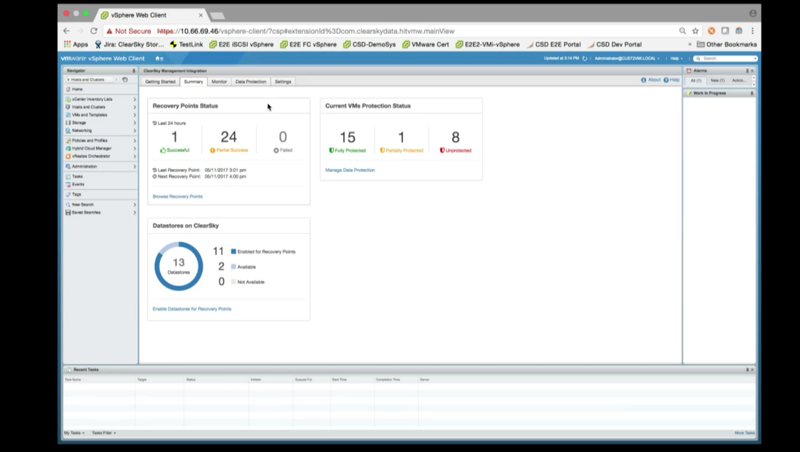 This enables VMware admins to easily manage and provision storage to their environment. Coming from a world of on-premises workloads and private cloud, this may be an appealing option to some to start moving out towards the public cloud, especially with the cloud edge appliance. Data is migrated to the cloud every 10 minutes from the ClearSky POP, allowing for a relatively low RPO for cloud recovery. 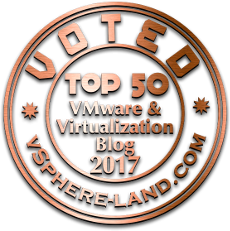 However, there will still be the need for a standby VMs to access the data volume, or the use of a solution to replicate the on-premises VMs to native EC2 instances which would then access the iSCSI volumes. As far as security is concerned, all data traffic from the Storage gateway on-premises to the ClearSky POP, to the Cloud instances, is encrypted with AES 256 as well as encryption at rest on the actual storage nodes. This should be a requirement for any organization who has data sitting on disks outside of their control. For disaster recovery, there are some caveats to think about. 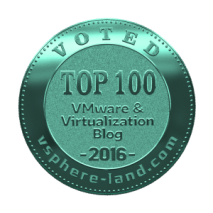 By leveraging a storage gateway at each site, a company can handle a site failure quite well using VMware’s HA (High Availability), since both sites ESXi servers share the same storage – hosted at ClearSky. If one site went down, HA would simply move the workloads over to the second site. However, this does not help with mitigating corruption, like a journaling replication solution would. The flip side is that neither does a synchronously mirrored metro-cluster solution. ClearSky also has some built-in backup capabilities. Like some other storage vendors, this is via storage based snapshots. With the vSphere integrated management, you can restore the entire VM, or restore the VM in a sandbox environment, and restore individual files from there back to the production environment. Because ClearSky is only available in select metropolitan areas at this time, it’s not for everyone. Those outside of the East coast are not able to partake in the ClearSky solution at this time. However, given their vision and drive, I see them expanding in the near future to more and more locations. All travel expenses and incidentals were paid for by Gestalt IT to attend Tech Field Day 14. Additionally, ClearSky provided a gift to all delegates but with no expectations about the coverage through this blog or social media.